Oh Brother Where Art Thou has to be one of my favorite Dieselpunk movies. 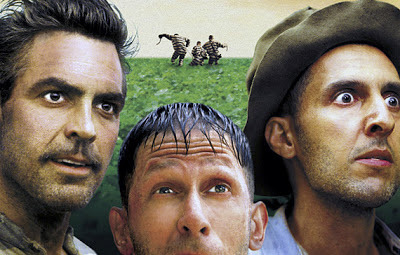 Written and directed by the great Coen brothers, George Clooney plays Ulysses Everett McGill who breaks out of prison and leads two fellow jailbirds on a hilarious road trip to recover hidden treasure while all the time being chased by the devil in the form of a lawman. The Coen brothers did a wonderful job of capturing Southern culture of that time and it’s simply amazing. Some might say this is actually just a period piece but let me make the case for it being classified as Dieselpunk. Starting with the basic story line, the Coen brothers took Homer’s "The Odyssey" and placed it in Mississippi during the 1930s. It has a Cyclops who was wonderfully played by John Goodman, Sirens, Ulysses misleading his men about the treasure, a prophet who warns of trouble, humans being cursed into animals (well kind of) and metaphorical scenes of forgiveness by Poseidon along with the circular axis heads. If that’s not enough, the Coen brothers Punk'd history. The governor of Mississippi in the movie, Pappy "Pass the Biscuits" O’Daniel, was loosely based real Texas governor W. Lee "Pappy" O'Daniel who did have his own radio hour and made his wealth through the O'Daniel's Hillbilly Flour Company. The real O’Daniel even had his own band called the Light Crust Doughboys. The name Soggy Bottom Boys was taken from the real-life Foggy Mountain Boys while the character Tommy Johnson was based on a combination of blues players Tommy Johnson and Robert Johnson who both had the legend of selling their souls to the devil at the crossroads. I would close with this quote from a scholarly paper by Margaret M. Toscano with the University of Utah, "The Coens humorously remake both Homer and the American folk tradition in a way that protects any of the originals from over-reverence. They keep putting new mustaches on the past, thus creating an on-going dialogue between the past and the present, the ideal and the mundane, to keep us questioning what is good and real, but always indirectly through humor so that we hardly realize the questions have been asked." Yes, Oh Brother Where Art Thou is Dieselpunk.